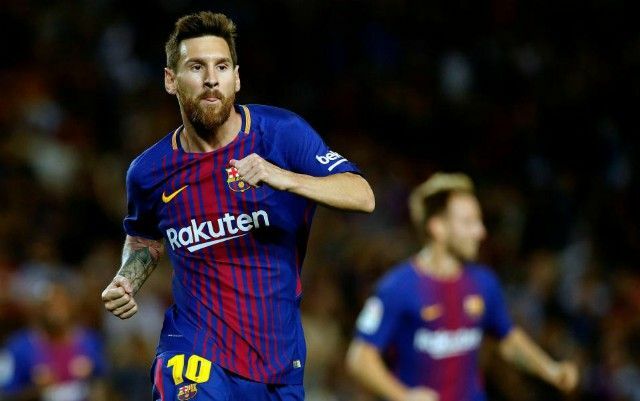 With his previous contract set to expire next summer, Barcelona superstar Lionel Messi faced an uncertain future ahead of signing a new deal last month. The 30-year-old joined the Catalan giants in 2001, initially coming through the youth ranks before making his impact at senior level where he’s gone on to score a staggering 524 goals in 604 appearances in all competitions, while winning eight La Liga titles, four Champions League trophies and many others. In turn, seeing him potentially feature in a different jersey next season would undoubtedly have been a strange sight, and according to Marca, Man City did their best to prise him away from the Nou Camp. It’s claimed that the Argentine icon was offered a whopping €100m signing on fee, along with a salary of €50m-a-year, which works out at £850,000-a-week as they looked to secure an incredible transfer swoop. The move would of course allowed Messi to seal a reunion with former boss Pep Guardiola, who has guided City to the top of the Premier League table and is impressing in Europe with his side too which arguably would have been an attractive proposal for Messi. However, the Barcelona legend has since opted to remain at the Nou Camp, where he has scored 17 goals in 21 games for Ernesto Valverde’s side, with the Barca coach enjoying a positive start to life in charge of the Spanish outfit. Whether that results in silverware at the end of the season remains to be seen, but having penned a new long-term contract, it looks as though City have missed their opportunity to convince him to leave, although given the figures noted above, they certainly made what would have been a very attractive financial proposal.